Over the 3/20/10 weekend I decided to create two raised beds for vegetable garden. I photo documented the construction. For wood I used 2"x12" spruce with 2x4s as posts. 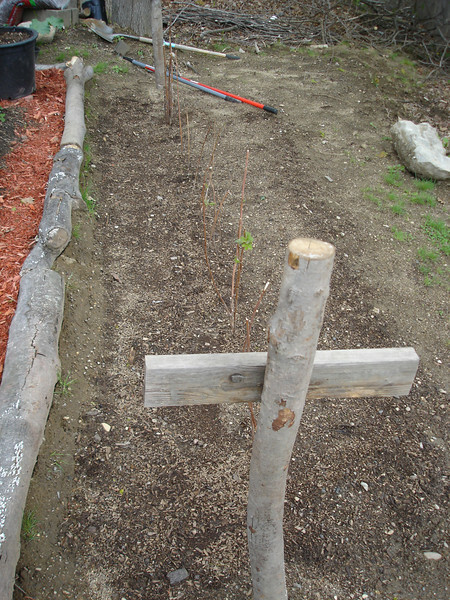 I built the beds using 3.5" deck screws and then positioned them and dug the stake holes. The next step was the trickiest - leveling the earth for the beds. The yard is on an incline so that took a lot of trial/error and leveling. Once the beds were positioned I took out the top layer of top soil, turned the earth and added a mix of peat moss and composted manure. I used about 15 cu. ft of peat moss and over 20 40lb bags of compost. Back breaking. I then dug 2' wide paths around the beds, got rid of the grass, and leveled it best I could. I laid down recycled weed blocker and staked it with biodegradable corn starch spikes. I then laid down a layer of cedar mulch to complete the path. All in all it took about one day. If I can find a source of cheap manure/peat moss I may add a third soon.